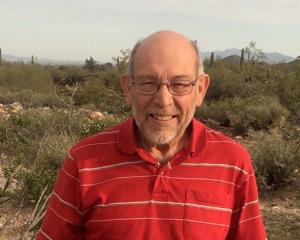 Although relatively new to Cox Meadows, Mike Pepera has resided in Arizona since 1953. He attended schools in Mesa including earning an Associate of Arts degree in Business Administration from Mesa Community College. Most of his career was as a heavy equipment operator which included earth moving machines, cranes and rock crushing-sand and gravel operations. He served many years in foreman and assistant superintendent positions. In Mesa, Mike raised a family of eight–7 daughters and 1 son. Mike is as avid bicyclist and has gardened for more than 40 years. After Meeting Susan Clay and retiring, locating in their Sweetwater street home has become the ideal situation for our shared trail, shopping and entertainment activities. We love the access to freeways, public transportation and airports. Mike feels It has been a privilege to meet so many of the wonderful people in Cox Meadows and wants to help achieve the “community” feeling that has been fostered by the many who have worked to bring everyone together.